JULIA SPENCER-FLEMING: What do you think of when you hear the word "Thriller?" International espionage? Terrorist plots? Ticking time bombs threatening thousands of lives? I love going on tour with the release of a new book. After nine or ten months of being sequestered behind my computer, touring is one of the many highlights of launch week and I look forward to it with much anticipation throughout the year. I particularly enjoy the opportunity to meet and talk with the folks who read and enjoy my books, and chatting with the wonderful librarians and booksellers who sell them. There’s another reason I love touring. Because my Kate Burkholder series is set in the fictitious town of Painters Mill, which is located in the heart of Ohio’s Amish Country, many of my events take place in that general area. If you’ve never traveled to northeastern Ohio, the region is a stunning collage of rolling hills, deep forests, farms with big red barns and, of course, the iconic horse and buggy. Holmes County, in fact, now boasts the largest population of Amish in the world. Many of my readers have a great interest in the Amish culture. Invariably, during the Q & A sessions, I get a lot of interesting and thought-provoking questions. One question in particular was asked on more than one occasion this year and went something like this: “Do the Amish read your books? If so, what did they think?” It’s a great question; one I’ve pondered myself. Over the last couple of years, while traveling in and around Ohio’s Amish Country, I discovered the answer to the question. While at an event in Dover last year, the librarian informed me that an Amish man, who was also a member of the local book club, would be attending my event. I was excited by the news. I wanted to meet him and talk to him. I’ve spent years researching the Amish culture, but I still have many questions and welcomed a one-on-one chat. That said, I was also a little nervous. If you’ve read my books, you know there’s a certain level of violence and rough language, and I couldn’t help but wonder how he would respond. After a wonderful event, I met the Amish man, Mark, and his driver, Denise, who was volunteering at the library at the time. It was such a pleasure meeting them. They had read my books and enjoyed them very much. They took me to the Amish and Mennonite Heritage Center where Mark is curator. Also known as the “Sistine Chapel of the Amish and Mennonites” the Behalt (which means “to keep” or “remember”) is a 10 Ft. tall and 265 ft long mural-in-the-round that illustrates the heritage of the Amish and Mennonite people from the Anabaptist beginnings in Zurich, Switzerland in 1525 to present day. I spent the next hour enthralled as Mark took me through the fascinating and many times violent history of the Amish. It was an enlightening and enjoyable experience—one I’ll never forget. I was lucky enough to travel to Dover again this year. After another fun and well-attended event, Denise, who is now a librarian, had several excursions planned, including visits with two local Amish families with whom she is acquainted. The first home we visited belonged to Mark (who I had met last year), his wife Salome, and their two children. Denise and I were met with friendly greetings and invited inside. Knowing I’m interested in all things Amish, Mark showed me around the house, pointing out the interior lighting, which is powered by natural gas. It was hot that evening so after a short tour of the house and grounds, we sat on the deck where we ate lemon squares (homemade and awesome) and drank coffee and iced tea. 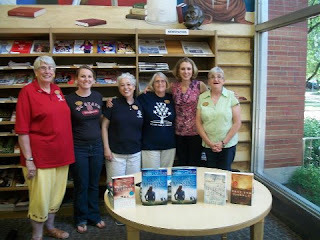 We talked books and local happenings. Later, Mark invited Denise and me for a buggy ride. He pulled his horse, Jim (a Standardbred/Dutch harness cross) from his stall, backed him up to the buggy and quickly harnessed him. Having my own horses at home, I was very interested in how everything worked, and I was particularly interested in Jim. I asked for permission to pick up his hooves so I could take a look at his shoes and Mark explained the horse wears a special studded shoe to prevent slipping on the asphalt. With Mark at the helm, we took Jim for a spin around the neighborhood. On the way back, Mark asked me if I’d like to “drive” and his question was met with an enthusiastic “I’d love to!” The evening was relaxing and fun, but it was also a learning experience and I enjoyed every minute of it. The next day, Denise and I visited with another Amish family. Ada, her husband, Andy, and their five children live on an 88 acre dairy farm, not far from where we had visited with Mark and Salome the evening before. After introductions were made we stood for a silent prayer and then sat down for homemade lasagna, salad, bread with homemade apple butter, mint tea, and for dessert, date nut pudding, which is an Amish favorite. During dinner, I learned that Andy has a wicked sense of humor after he told a joke that had everyone at the table chuckling. I also learned Ada had her last child at the age of 47. Through Ada’s scrapbooks, I learned some of the history of their family and the farm. After dinner, Denise and I walked down to the barn and watched Andy bring in the cows and milk them. He showed me the milking machine, which was run off of a generator powered by natural gas. He also introduced me to two new-born calves, which were awesomely cute. We also toured the rest of the farm which was beautiful and included a picturesque pond. Toward the end of the evening, as I was getting ready to drive to Cleveland for another event, Ada asked me about the books. She hadn’t read them and kindly told me she had no plans to do so. She asked me why I wanted to write such things. I answered honestly, telling her I love writing crime fiction, I’m fascinated by the Amish culture, and I prefer gritty over cozy. She asked me if my books were appropriate for children and I told her no. Ada remained kind and polite, but, unlike Mark from the evening before, I sensed a certain level of disapproval. I’d wanted to take photos, but out of respect for these two families, I’d left my camera at the hotel. Denise, however, did snap a few shots and was careful to leave our hosts out of the picture. I very much enjoyed my time with these two families and I was thankful for their generosity in opening their homes to me. 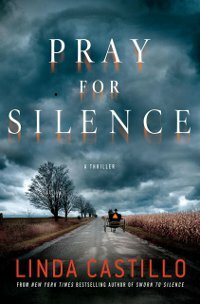 In the course of writing the Kate Burkholder series, I’ve done quite a bit of research on the Amish, most of which I gleaned from books or the Internet. But neither of those resources can replace dinner at an Amish home, conversation on the deck at dusk, or driving a buggy and wondering if the approaching vehicle is going to move over in time to avoid causing your horse to shy. Books and the Internet definitely play an important role when it comes to research—but there’s no way you can smell the bleach when the farmer cleans the udders of the milk cows. Or hear the blare of the generator that powers the milking machine. Or smell the earthy scent of the horse and the leather from the harness. Or hear the red-winged blackbirds calling from the trees that grow alongside the pond. Most importantly, you can’t delve into the minds and hearts of the individuals who comprise such an interesting and enduring culture. 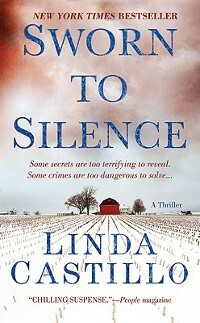 You can find out more about Linda, read excerpts of her books and listen to audio selections at her website. 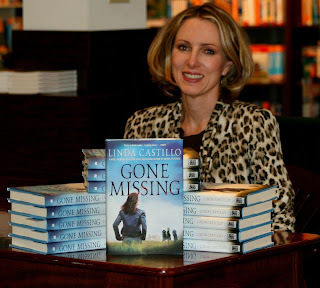 You can also friend her on Facebook and follow her on Twitter as @LindaCastillo11. Thanks for visiting us today Linda! Amish mysteries are popular on the cozy mystery shelves and also, I've seen Amish romance published. any thoughts about why the Amish theme is so popular these days? Great question, Lucy. I think what makes the Amish theme so popular is curiosity about the culture. The Amish are somewhat of a closed society and that makes them slightly mysterious. We want to know more about them. With regard to thrillers in particular, I think it is that justaposition of the peaceful setting and the introduction of something evil into it. I *loved* WITNESS, btw. One of my all-time favorite moves. Fascinating stuff, Linda. I agree: no amount of research substitutes for the real experience. And now I have four more books to add to my TBR pile! Looking forward to it. Will your new insights make it into the book you are righting. As you know, I love this series and can't wait for the next one. Welcome to JRW, Linda! I'm excited to see you here. Love your books and can't wait to get my hands on the new one. Lucy, I also think the fascination with the Amish stems from the fact that we live in time of great change. Many people have difficulty with all the change and wish for a simpler, easier time. They look at the Amish and see them living in that idyllic time, totally unaware of the stresses and strains the Amish culture is also experiencing. and speaking of change I've had to go through four captchas today to get one I could read. What's with that? Make it six! SO fascinating! ANd exactly, Linda..this is a group of people who are living essentially next door--but whose lives couldn't be more different. and that sense of "disapproval" for "outsiders"--what's the word they use? Is so palpable. Congratulations n your mad success! The Amish have the tidiest farms, don't they? Many years ago my husband was making a film for the Muskingum Watershed Conservancy District, much of which is in Amish country. We thoroughly enjoyed driving through lovely, well-kept farms, and talking with the various Amish farmers. Steve took a lot of photos, including a few of the sweetest milkmaid of a young girl. The young do not have the same prohibition against being photographed, which is how he was able to obtain permission from her proud parents to take her picture. Linda, I will definitely add your books to my "must read" list! Thank you for this charming post, and best of luck with the new book. That was lovely. Thanks so much for sharing this, Linda. I've admired your books for awhile now, and I'm looking forward to reading your latest! I find what Jan wrote for the introduction interesting. 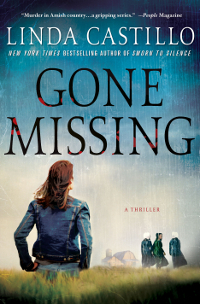 The term "thriller" does imply a certain kind of book--espionage and all that...I would have labeled your novels "mysteries"...These days, what IS a thriller anyhow? What a cool trip you had. Thanks for being willing to share your experiences with us. I'm going to be looking for highlights in your next books (which I love). Thanks, Edith. So true....nothing can replace the hands on experience. Hope you enjoy the books! Excellent point about some folks longing for simpler times, Linda. I've been watching AMISH: OUT OF ORDER on NatGeo and there was a young girl who wanted to become Amish because she was having problems and wanted a simpler life. It was a fascinating segment. I can see how someone might want to do it. Thanks, Hank. You are so right about the "disapproval" being palpable. I felt it and while it wasn't pleasant, it was a valuable experience in terms of understanding. That kind of understanding helps a lot with the writing and getting the Amish midset right. Thanks, Lisa. I've had my books categorized many different ways such as "Crime fiction," "Mystery" and "Thriller." I think you are correct in that the books are best categorized as a mystery. I recently read that a mystery is a book in which the reader doesn't know who the villain is. A Thriller is a book where the villain is revealed early on, but it is the element of danger that keeps the reader engaged, as opposed to the "who done it" element. Does that make sense? Thanks for the great question! Hey Barb. Thank you! So nice to see you here. (and I'm so pleased you are enjoying the books--thanks!) It was a wonderful trip in so many ways--really enjoyed every minute of it. 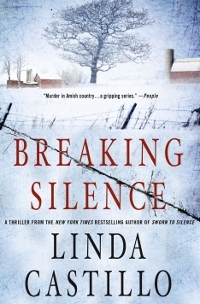 Linda, I am so happy to learn about your books here! I must have been under a rock, but I am starting your series as soon as the first arrives, or is downloaded if available as e-book. Going to check right now! Thanks, Julia, for the introduction!